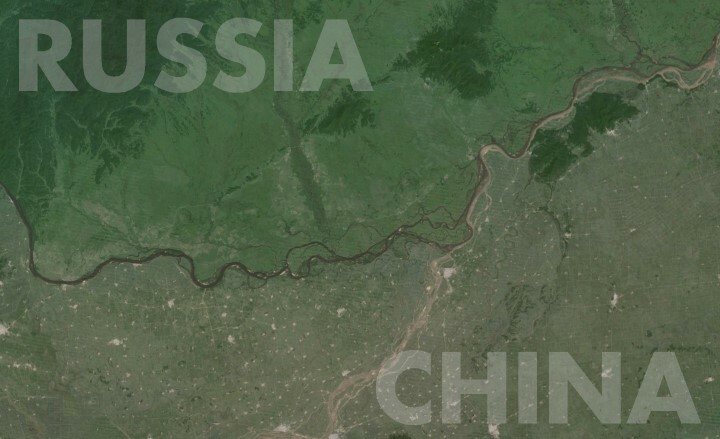 The Amur River (called the Heilong Jiang in Chinese) separates Russia’s Far East from Northeast China. And as the map shows, the contrast could not be much more striking. Russia’s entire Far East has a population of just 6.3 million people (around half as many living in Moscow) who live in an area of 6.2 million sq km (about twice the size of India). This means on average there’s just 1 person per sq km of land. However, the population of Northeast China, just to the south, is 107 million people (slightly more than live in the Philippines), in an area of 787,300 sq km (about the same size as Turkey). Thus the population density is around 135 people per sq km, which puts it just slightly below the Chinese average. This divide can be very clearly seen in the map above. Populous China looks very developed while Russia looks deserted. Interestingly, the Russian part of the map above is the Jewish Autonomous Oblast, which despite its name, contains just 1,628 Jews (around 1% of the population). Given that Russia’s side is depopulating and China’s is growing, the potential for future conflict looks like a plausible, if still remote, possibility. 1. Because the most organic, Siberia may prove to be the most durable European conquest of the post-Roman era, and even that is highly uncertain. White babies are a minority of babies or close to it, throughout the Anglosphere (but of course that’s becoming true in Western Europe too), and the British were the only colonial power to successfully outbreed natives. Geographies tend to return toward their original genome, partly because conquest is often a matter of a few male conqueror genes in a sea of native female genes and partly because ‘blood is adapted to soil’ in deeper ways than we commonly guess. Slavic Russia needs to recover birthrates in its European territory before it can mount a demographic reconquista of Siberia. 2. Rivers make crappy natural borders for humans compared to watersheds: less durable, more conflict. Wow! I googled Amur river in Russia/China because we have just released an Amur falcon which was injured during its migratory visit to my province KwaZuluNatal in South Africa. Hopefully it will make a safe trip back home. They leave around May month for the journey back home… Thank goodness we don’t let politics, racism and nastiness influence us.